Hi! Welcome to All About Pacino. 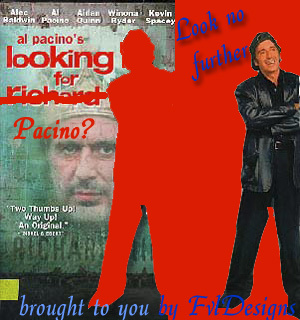 Al Pacino, coming soon - The Pacino Family which is a family full of talented individuals. A webpage full of fun and interesting stuff about this talented actor who gives us his all in his performances. Click on the links below to begin finding out more about this wonderfully talented and good looking man. Most of the pictures are gathered from around the web, if I am using something I shouldn't be, please contact me. Also If I am saying something that isn't correct contact me too. Or if you like what I'm saying, are an Al Pacino fan, Are interested in the performing arts and drama (like I am), or if you know anything of Al's future roles! Hm. I guess what I'm getting at is - here is my e-mail address. Oh yeah, sign the guestbook, too. be sure to check out this new site!